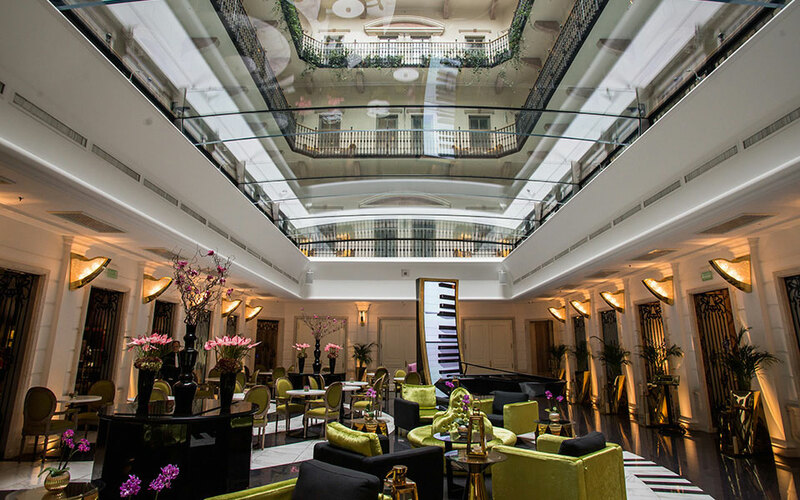 Aria Hotel is a luxury boutique hotel in Budapest with unique music themed design and services. 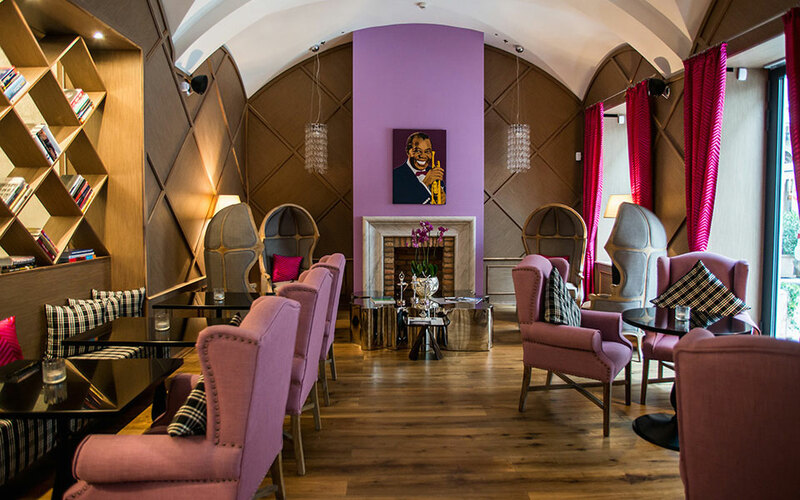 However, Aria is not just a place for visitors to Budapest, but it’s also one of the few hotels in town that encourages locals to experience its many services. 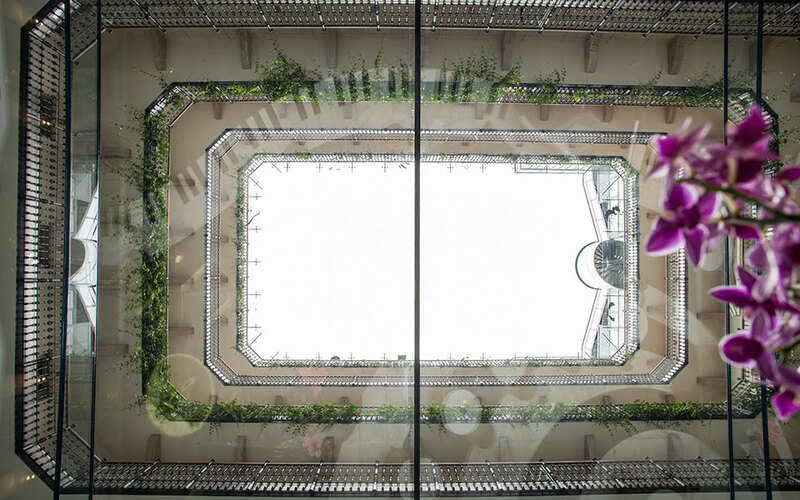 So here is why we think it’s absolutely worth checking out Aria Hotel Budapest. Check availability & prices. Aria Hotel is a great example of unique interior design in Budapest. 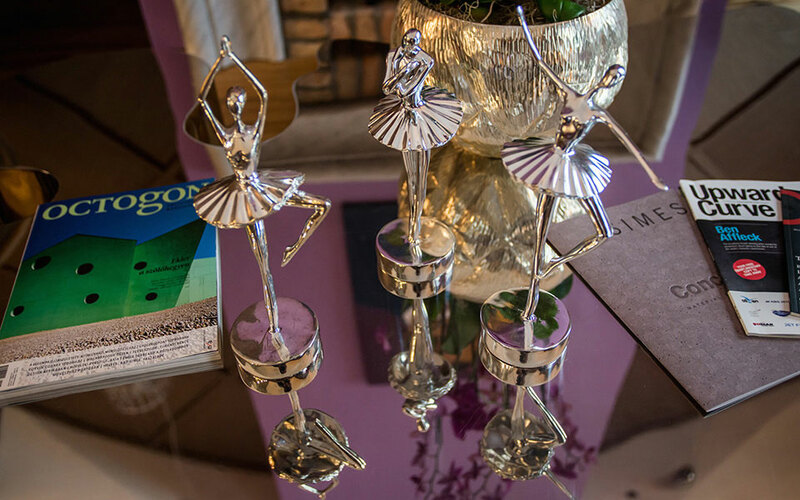 If you haven’t read our interview with interior designer Zoltán Varró yet, then make sure you glance it through as it gives you some great insider info about the design concept. If you’re at Aria, don’t forget to check out the glass roof over the lobby area, which was modelled after the Apple Store glass cube in New York. Also, make sure you give yourself enough time to observe the beautiful details around you. So instead of just looking at the big picture, pay attention to the flower arrangements, the plates and glasses, the materials and the colors. 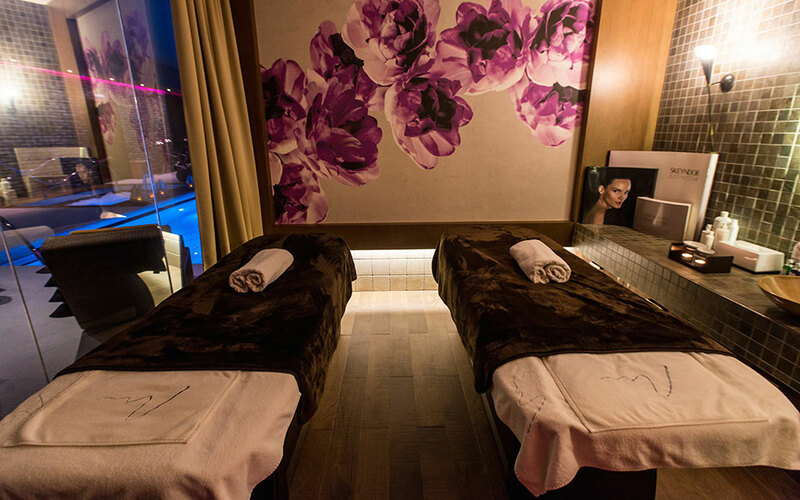 You will see that spending time at Aria is a real visual treat! Creating a welcoming environment was an important aspect already during the construction of the hotel. As part of this concept, the reception desks, which usually dominate hotel lobbies, were placed to a separate area in order to create a more relaxed environment for visitors. As a result, when you enter Aria, you’ll find yourself in a pleasant lounge area that was fittingly named the “Music Garden”. And this is the area, where you can enjoy a delicious breakfast everyday between 7am and 11am. If you’re not a guest at the hotel, the price of the breakfast is HUF 7500 (+12% service charge). 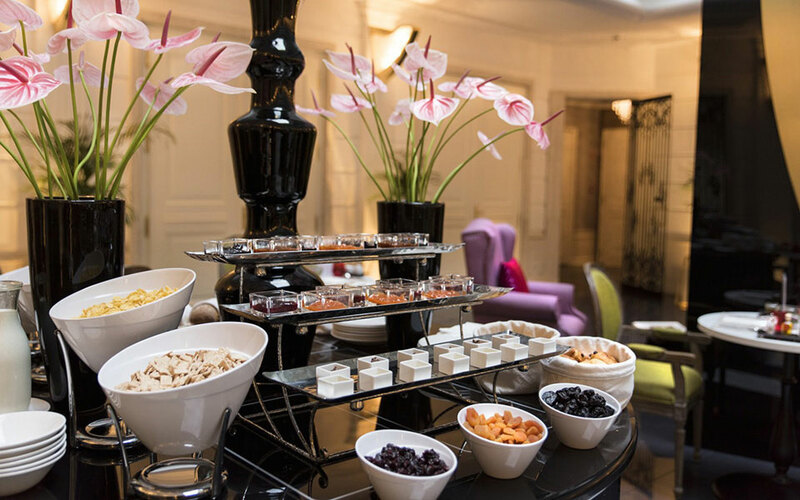 You can choose from the usual breakfast specialties, such as croissants and pain au chocolat, freshly baked breads or mini brown and white baguettes. They also have cereals, homemade jams, farm yogurts and fresh fruits. If you want to have something more filling, then you can order eggs, hams, sausages and more. Click here to see the full breakfast menu. Harmony Spa, which won the prestigious “Europe’s Best Wellness Spa” award in 2015, is definitely one of our favorite spots at the hotel. 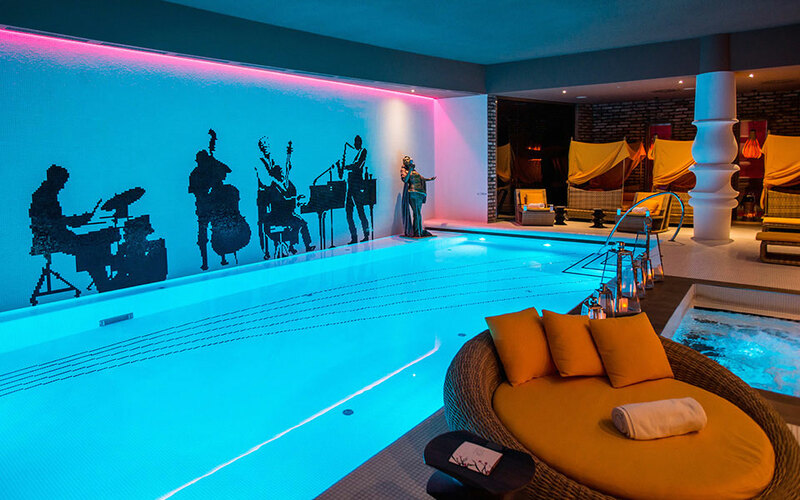 Music, of course, is part of the concept at the spa as well, so you can choose from treatments with the following music inspired themes: “The Classical – Energizing Symphony”, “The Jazzy – Detoxifying Downbeat”, “The Operatic – Balancing Aria”, “The Contemporary – Relaxing Groove” and the “Hungarian Rhapsody Treatment”. 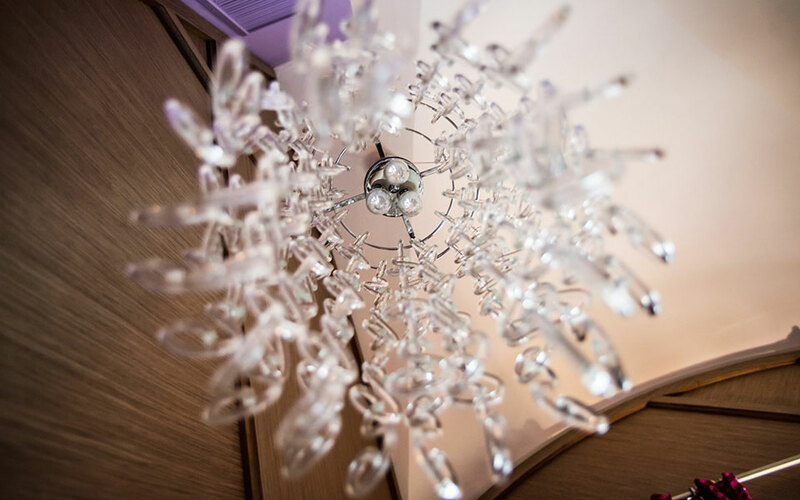 Depending on which treatment you choose, you will be listening to a curated playlist, in this way, making your time at the Harmony Spa even more enjoyable. 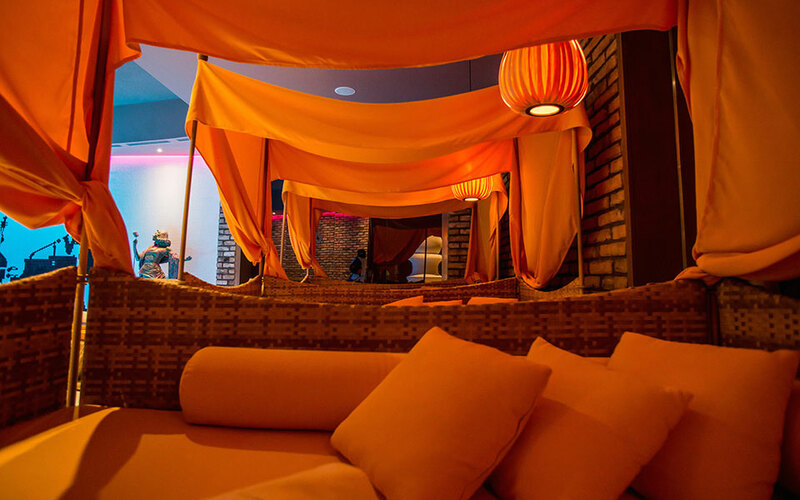 The staff is very nice and they can tell you all about the different treatments, based on what kind of experience you’re looking for (relaxing, detoxifying, etc.) During the treatments, they use Skeyndor products, a Spanish brand that’s been around since the 1960s, and you can also purchase these products on the spot. Aria, being a luxury boutique hotel, will provide you with everything you need for the perfect relaxing experience, including a bathrobe, towels, slippers, etc. 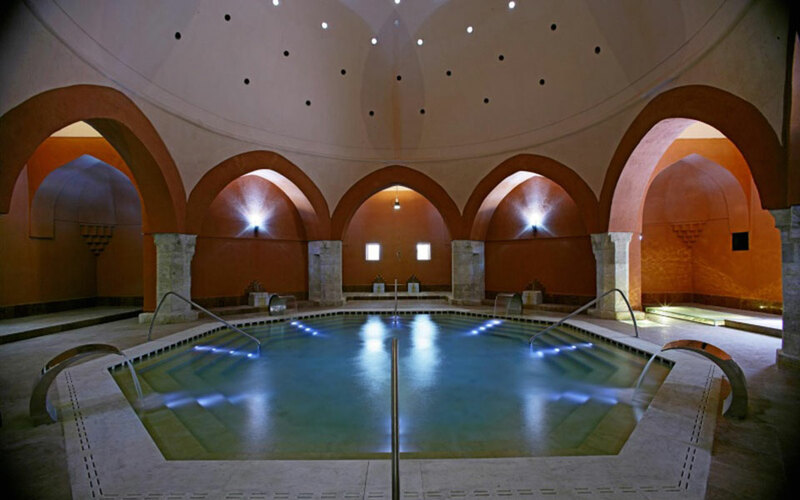 After your spa treatment, make sure you check out the wellness section, where you can enjoy the saunas, jacuzzi and the swimming pool, or just relax on the comfortable sofas. 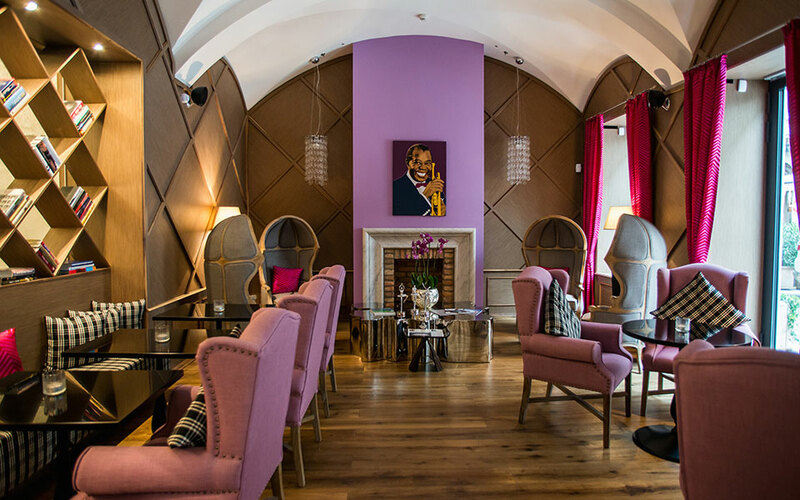 If you’re looking for a cozy spot in Budapest, then you should check out the Satchmo’s Library at Aria. 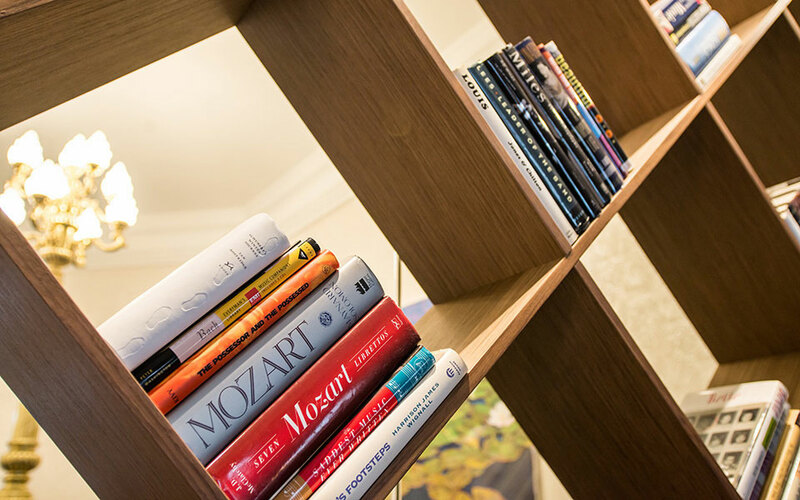 You’ll see that Aria doesn’t have that typical busy hotel atmosphere, so the Satchmo’s Library is also a great choice if you’re looking for some quiet time in the city center. The Satchmo’s Library is the area off of the entrance of the hotel, right across from the Satchmo’s Bar. 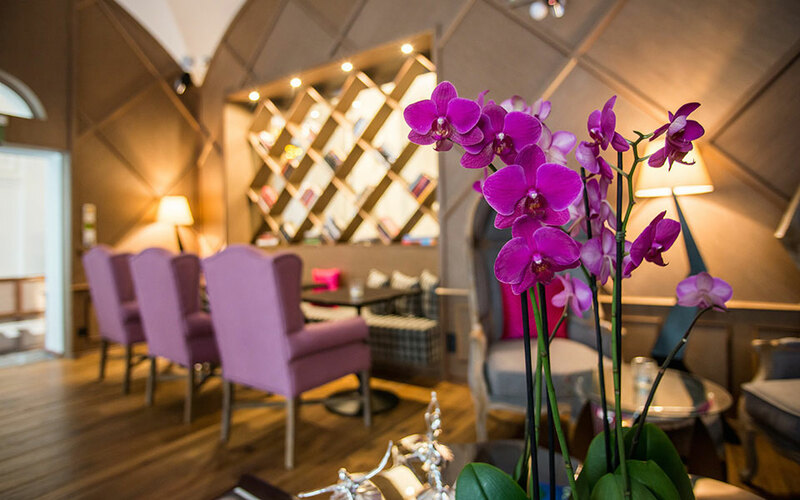 The library is the perfect place to have coffee or tea and to enjoy your book or a magazine. You’ll also find some great music related books and design magazines there as well. The warm shades of brown, grey and magenta and the comfortable furniture will help you relax, and during winter time, you can also enjoy the cozy atmosphere of the fireplace. There is something magical about being on top of the city, and when the summer heat really kicks in, it’s also nice to enjoy the cooler air on top of some beautiful buildings in Budapest. Fortunately, there are some really great rooftop bars in the city, where you can hang out during the summer months. By now, you must know these special places, including the 360 Bar or the cute little terrace above Liebling. But if you haven’t been to the High Note SkyBar at Aria Hotel, you don’t know what you’ve been missing out on. For one thing, the view is absolutely beautiful. You’re only a couple of meters away from the cupola of the St. Stephens basilica, so you can take a thorough look at this beautiful building from really up close. We also love that they have very comfortable sofas that are spaced out enough so that you can enjoy a more private time with your friends. What is also really great about this rooftop bar is that it’s open during winter time, too and they have a covered area with glass walls where you can enjoy the beautiful view without standing outside in the freezing cold. Of course, you can also check out this rooftop terrace during the day for coffee, and you can even take a yoga class there on Sundays. The class costs HUF 5000, and the price also includes a welcome drink and entrance to the Harmony Spa & Wellness for two hours after the class. There is a special High Note SkyBar menu with food and drinks, so you can also get a light dinner or snacks there. Click here to see the menu. We highly recommend that you try the Andrea Rost cocktail with champagne, grapefruit peel and Grand Marnier. 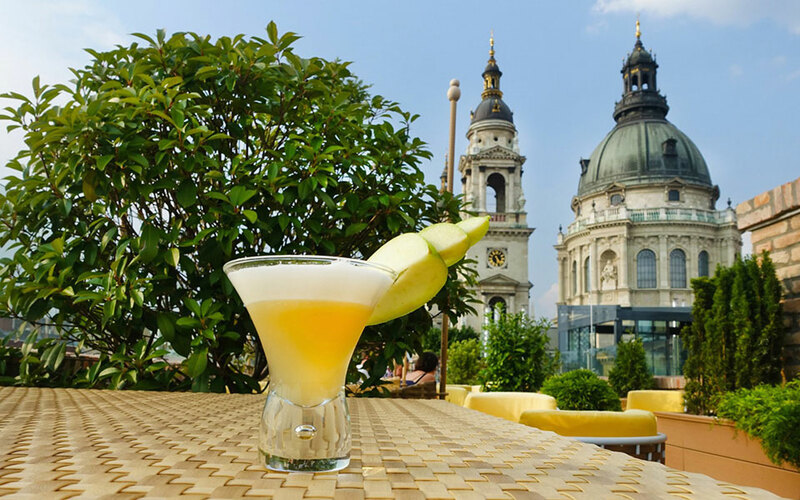 This delicious drink was named after the world-class Hungarian soprano, who is also the music curator of the Opera rooms at Aria Hotel. 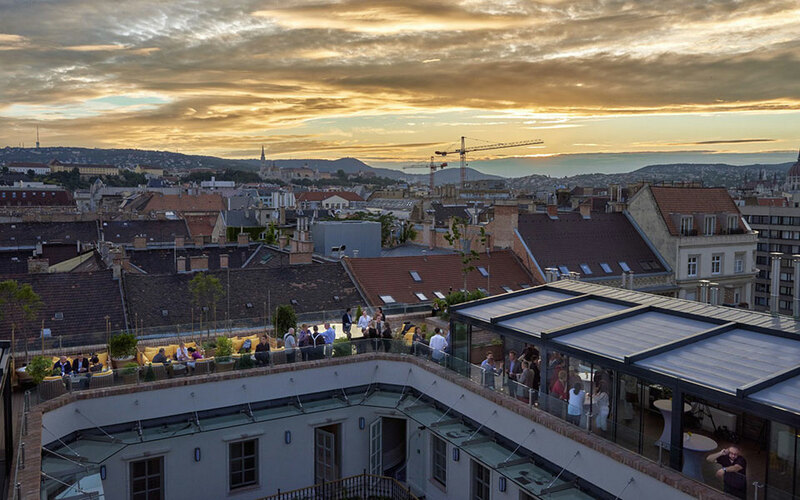 Email the High Note SkyBar at dining@ariahotelbudapest.com to reserve a table. 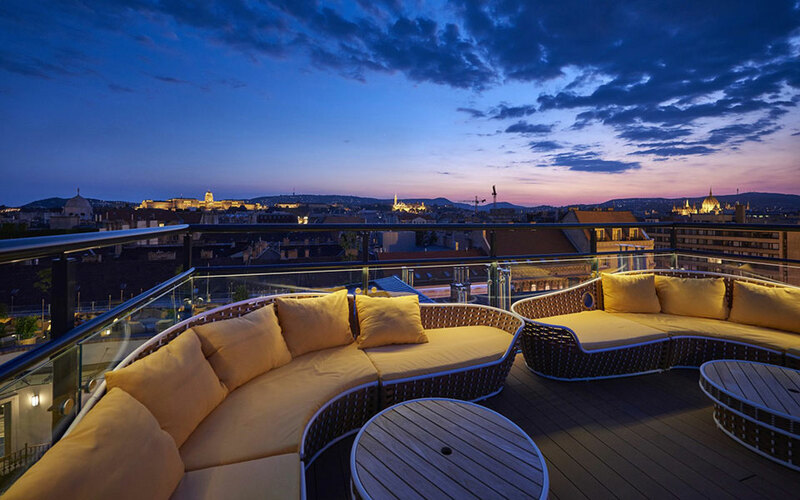 Want to stay at Aria Hotel on your trip to Budapest? Check availability & prices. Disclosure: This article contains affiliate links to booking.com. 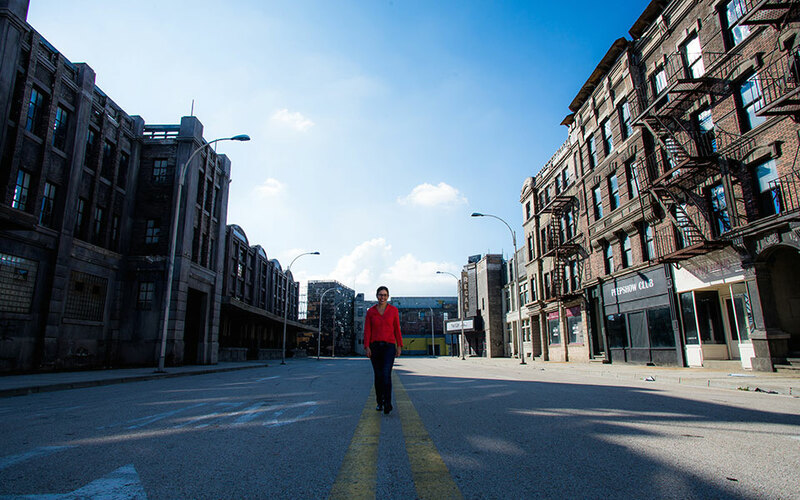 If you decide to book your accommodation through these links, we’ll earn a small commission. And while you won’t have to pay anything extra when you complete a booking or make a purchase through these links, this small commission will make it possible for us to continue publishing similar articles on Budapest Local. wow as a travel blogger (with dog) this seems like a gem! I know they are pet friendly too!